As a veteran, I would like to say 'Thank You' to our brave men and women of the armed forces. Rather than display a bunch of fireworks and a dropping apple on New Years Eve, I prefer offering these three tear-jerking commercials that really do a good job in relaying how I feel about our military personnel. Happy New Years. . . And Thank You. A swimming pool available to the public in Illinois, probably for reasons of safety to the swimmers, and the pool equipment, have a dress code for jumping in the water. Both private and public entities share having dress codes. Golf Courses generally don't allow blue jeans, cut-off shorts, and collarless shirts. Schools in California generally disallow spaghetti straps on girl's blouses, or any attire that could stir up gang related trouble - including bandannas, gang associated emblems or writing on shirts or jackets, and pro football jerseys and caps. Some restaurants require a tie and a jacket, and some nightclubs don't allow open toe attire for men. The great thing about a free society like the one we enjoy in America is that if a group has a problem with the policy of a business, or public facility, they are free to get together and open a business of their own that will accommodate their preferences. They can then set their own rules for that establishment. Instead, because somehow members of our society think every little disagreement is some form of discrimination, we keep seeing these offended groups take it to the courts. People choose to be offended. It's a choice. I wish these people would stop whining, and use the free market system to fit their preferences. Go into business and open a swimming pool facility that allows hijabs, turbans, grenades, and whatever else these people want to wear into the water. When discussing the issue of the Muslims suing over the policy regarding proper swimming attire at a swimming pool, a person hoping to defend the Muslim's claim of discrimination reminded me of the old swimming pool rules in Corona, California long ago when she was just a kid. Back then, Mexicans were only allowed to swim in the public pool on Wednesdays. . . because the city cleaned the pool on Thursdays. The two cases, however, are very different. The Corona pool scenario targeted a specific group, and was obviously discriminatory. But the Illinois pool dress code applies uniformly to all persons, in accordance with the 14th Amendment. The Muslims received equal treatment under the law. Anybody not wearing the proper swim attire would not be allowed to swim in that pool, regardless of who they are, what they are wearing, or what religion they are. The lawsuit by the Muslims is only designed to serve one purpose: to convince America to give Islam yet another concession. In America, we should not have to adjust our society to the needs of the foreign immigrants. It is up to the immigrants to adjust to our society. In the video I posted earlier today (Liberalism Disregards the Constitution) Ezra Klein indicated, in response to the question that Conservatives of the Republican Party wish to read the Constitution aloud on the floor - Is this a gimmick?, in an interview on MSNBC: "Yes, it's a gimmick, I mean, you could say two things about it: One, is that it has no binding power on anything; and two, the issue of the Constitution is not that people don't read the text they think they're following, the issue of the Constitution is that the text is confusing because it was written more than a hundred years ago, and what people believe it says differs from person to person; and differs depending on what they want to get done. So, I wouldn't expect much coming out of this." Ezra Klein is typical when it comes to liberal thinking, having a complete disregard for the rule of law. Mind you, these people don't believe the U.S. Constitution is the law of the land as indicated not only in the text of the founding document, but also in the writings of the Founding Fathers. As Ezra said, they believe the document has no binding power. The liberals have transferred the idea of "rule of law" from the Constitution, to Case Law, or more specifically, to a bunch of judges. What this means is they have ceased to believe in the rule of law, and they now follow the rule of men through an emerging judicial oligarchy (one that has been beholden to the liberal agenda, and any liberal president). That is exactly the kind of system our Founding Fathers fought against in the War of Independence. Also, in an attempt to make the Constitution sound antiquated, Ezra said, "it was written more than a hundred years ago." Did he not know that it was over 200 years ago that the Constitutional Convention took place? Wouldn't the truth have been better if he was trying to make it sound old? No wonder the text of the Constitution is confusing to Ezra Klein - he doesn't even have enough brains to figure out how old the document is. And of course he thinks that the Constitution differs from person to person in what it says based on what they are trying to do. . . that's how liberals work. They change the interpretation, twist the truth, and are even willing to contradict themselves, to sell their authoritarian, centralized, socialist agenda. Oh, and Ezra? I disagree with you. The reading of the Constitution will make a big difference. We are moving back in the direction that our nation is supposed to be, and if the patriots of this country remain consistent and persistent, anti-American twerps like you will be a thing of the past. I think it is safe to say that the 111th Congress has been the most damaging, and unpopular, Congress in the entire history of America. The liberal activity during the lame duck session of 2010 was especially egregious. The media, in cahoots with the hard left authoritarian Democrats, are trying to make heads or tails of the insanity in order to write positively about it, but even the Marxist journalists are finding it hard to defend the congressional madness. In addition to the Congressional end around, the regulatory decisions during the lame duck session may have very well been a preview of the underhanded lawmaking we will see the Democrats engage in during this coming 2011 year. Rather than follow the law, and for all legislative actions to originate in Congress, the leftist government agencies created regulations in order to circumvent the Congress. In a true betrayal of the U.S. Constitution, the Federal Communications Commission (FCC), the Environmental Protection Agency (EPA), and the Department of Health and Human Services (HHS) advanced the liberal agenda despite the law. The HHS unveiled new price controls for the health insurance industry, forcing health insurance companies to receive permission from the Obama Administration before they can raise rates by more than 10 percent. The theory is that the price controls will help decrease rising health care costs. In reality, the price controls will cause shortages, rather than better health care. That is the plan, however. The federal government is doing all that it can to completely destroy the final parts of the private industry so that they may move in the direction of government controlled health care through an emerging single-payer system. The FCC released its “net neutrality” rules, which will allow the federal government to begin regulating the Internet. The FCC did this regardless of the protest by the public and by Congress, and a federal court ruling that stated that the FCC does not have the authority to put into place these regulations. Left unchecked, this department is systematically dismantling our freedom of speech, while seizing powers not granted to it by the Constitution. The EPA announced that it will begin regulating power plants and oil refineries. The idea is to slow down the greenhouse gases going into the atmosphere in order to stop man-made global warming, which has been proven by science, and leaked Emails, as being a hoax. Worse, the seizure of power by the EPA through these regulations is unconstitutional. The EPA does not have this authority. The Bureau of Land Management is also issuing new rules, but in their case it will make it harder to develop natural resources on government-owned land. Both of these measures will not only drive up the cost of electricity but will also make us more dependent on foreign sources of energy. The Obama Administration, through the regulatory madness of these federal agencies, is quite literally making Congress irrelevant. The Democrats are doing all they can to step up their leftist agenda, despite the fact that the people rejected the liberal agenda by overwhelmingly voting Republican last November. Article I, Section 1 of the U.S. Constitution states that all legislative powers herein granted shall be vested in a Congress of the United States. In other words, only Congress can make law, modify law, repeal law, or strike down law. These agency regulations are an example of parts of government other than the legislative branch making law. All of those regulations are unconstitutional. The Progressives don't care what the Constitution says, they could care less about the law, and they sure as heck don't consider public opinion as having any bearing on their decisions. The Democrats are political elitists who believe it is their role to force upon the people what the liberals think is best for the common good, despite the law. This is where the fight will be next year. Knowing that the liberals can't get anything past a GOP controlled House of Representatives, the Democrats will simply ignore the law, and put their agenda across through regulations - bypassing Congress altogether. Congress still has a weapon. The House of Representatives has the power of the purse strings, and can defund the liberal madness, if they dare. The real question is, will they? The leftist environmentalists will tell you that last decade is one of the warmest on record as a result of man-made global warming. Now, record cold snaps, and excessive snow, is also the result of man-made global warming. No matter the weather, apparently, it is the result of the man-made global warming lie. But now, it is snowing in Phoenix, Arizona. You know, the land of cacti and desert san. Hmmm, could it be possible that the global warming scientists are lying, and it is all based on political gain? Meanwhile, regardless of the fact that only the legislative branch is supposed to have any legislative powers, the EPA is moving unilaterally to limit greenhouse gases with their own regulations that was never voted on by the U.S. Congress. The true nature of an authoritarian tyranny. As a free people, we have the responsibility to do what we can to restrain our federal government when it begins operating outside Constitutional boundaries. In order to determine how to accomplish the feat of returning the government to its constitutional limitations, it is important that we understand the original intention of the framers of the founding document, the history that led them to create the constitution in the manner that they did, and how through two hundred years of creeping incrementalism our federal government abandoned its promise of republicanism. 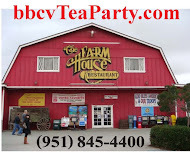 Every Thursday night in Temecula California Douglas V. Gibbs hosts a constitution study to help you discover your American heritage and birthright. 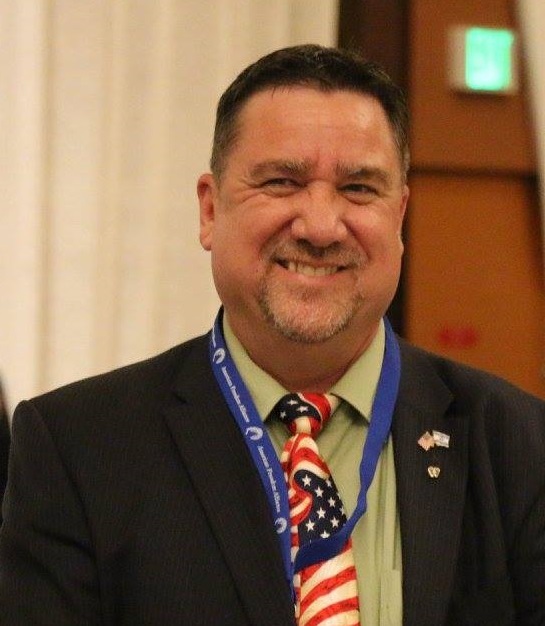 Join us on Thursdays from 6:00 pm to 7:00 pm for basic Constitution studies held in the classroom at Faith Armory, 27498 Enterprise Circle West, #2 in Temecula, California. Constitutions are handed out to all attendees. Tonight we will be reviewing Original Intent, the Preamble, Article I, and Article II. Article II establishes the Executive Branch. Article II, Section 1 establishes the offices of President and Vice President. The election process is by the Electoral College. Originally the State Legislatures appointed the electors, but that was later changed in 1824 to a direct vote of the electors by the people (an attempt of those that support the progressive idea of a more centralized government to move this nation in the direction of a democracy). The change was technically unconstitutional because no amendment was proposed and ratified. Section 1 also requires the President to be a Natural Born Citizen of the United States, as well as establishing his compensation. A Natural Born Citizen was one that was not only born in the United States (or a territory) and whose father was an American Citizen. Based on the language of the Immigration and Naturalization Act of 1798, a person born of two American parents overseas may also make a similar claim. The importance of the father being an American citizen when it came to being a natural born citizen was so that the President would not have divided loyalties. Article II, Section 2 gives the President the power to be Commander in Chief of the armed forces, and of the militias of all the states, which means that he is able to wage war. The declaration of war, and the funding of war, is reserved to the Congress. The ability to wage war was an important power for the president, for due to the times, if the United States needed to mobilize its military rapidly, the President did not have to wait for all of the members of Congress to return to Washington to hold a vote. If, later, the Congress wished to Declare War, such a declaration would enable the United States military to more freely fight on the battlefield. A formal declaration warned other nations that a state of war existed, and that it was advisable to remain out of the zone. Without a declaration of war, if a non-participating party entered the war zone, any action against them would be considered an act of war. If Congress did not agree with the President waging war, they have the power to defund the war, hence providing a check against the executive branch from using its power to wage war without oversight, or without limitations. Section 2 also states that the President may have a cabinet to assist him, but that the appointees must be through the advice and consent of Congress. He may make treaties with other nations, but the treaties must be ratified by the Senate. The President may also pick judges, and other members of government, but once again none of this can be done without the approval of the Senate. This is where the constitutionality of "czars" comes in question. Article II, Section 3 establishes the duties of the President, such as giving a State of the Union Address, making suggestions to Congress, acting as head of state by receiving ambassadors and other heads of state, and ensuring that the laws of the United States are executed. Article I establishes the Legislative Branch of the federal government. Article I, Section 1 of the U.S. Constitution establishes the two parts of Congress, and grants all legislative powers to the two houses of Congress. The funny thing about the word “all” is that it means, as shocking as it may seem, “all.” This means that all authority in regards to making law, modifying law, and repealing law (all legislative powers) and anything else that has to do with affecting law, belongs to the Congress of the United States. Therefore, any court cases that modify or strike down law, any executive order that modifies or creates law, or any regulation that is put into place without being proposed and voted into existence by the Congress, is unconstitutional. And, since the U.S. Constitution is the law of the land, that would make any court opinion, court ruling, executive order, executive action, or federal agency regulation that becomes law, modifies law, repeals law, or strikes down law an illegal action by that federal entity - making those pseudo laws illegal, unconstitutional, and null. All legislative powers belong to the Congress. The powers are herein granted. Herein means, in the simplest way, “here in.” So, the word “herein” indicates that not only do all legislative powers belong to Congress, but that those powers are listed here in the U.S. Constitution. Who gave the federal government those powers herein the Constitution? Apparently those powers were “granted” by someone. Granted means “to transfer legally.” Therefore, the legislative branch does not receive authorities for the sake of it. The powers are granted by someone to the federal government. As indicated in the Preamble, “We The People of the United States” grant those powers to the federal government. That way, those powers may be “vested,” or legally transferred, to a Congress of the United States, which shall consist of two houses; a Senate, and a House of Representatives. Article I, Section 2 defines the House of Representatives. The members of the House are divided among the States proportionally. The House of Representatives is the voice of the people in the federal government. Section 7 of Article I establishes that all bills for raising revenue shall originate in the House of Representatives. What that does is give the House the purse strings of the federal government, which in turn gives The People (remember, the House is the people’s voice in the federal government) the ability to stop anything they feel necessary to stop, by simply defunding it. The House also holds the sole power of impeachment. Article I, Section 3 defines the U.S. Senate. Senators were originally appointed by the legislatures of the individual States. This was changed in 1913 through the 17th Amendment. Each State has equal suffrage in the Senate, meaning each state has the same amount of Senators, two each. The Vice President is introduced in this section as the President of the Senate, who may be involved in all proceedings if he so desires, but his vote only matters if there is a tie. The U.S. Senate was the voice of the States in the federal government. Most everything the Executive Branch does is subject also to the consent of the Senate. The Senate ratifies treaties, holds hearings for any appointments the Executive Branch nominates, and the Senate holds the sole power for holding hearings on impeachments. Both houses together also have the ability to override a veto with a 2/3 vote. This system was designed to enable the People and the States to constrain each other through their appropriate congressional houses, and to constrain the executive together through the power of a vote. Article I, Section 4 establishes that each State may have its own methods for electing members of the Congress, and mandates, or requirements, and that Congress must meet at least once per year. Understanding this, it becomes clear that when the hanging chad controversy arose (Gore/Bush), the legal case should have only gone as high as the State Supreme Court. The federal government had no authority over that case, as per this section. Article I, Section 5 indicates that Congress must have a minimum number of members present in order to meet, and if the Congress deems it necessary, may set fines for members who do not show up. Section 5 states that each house may have its own rules, keep a journal to record proceedings and votes, and that neither house may adjourn without the permission of the other. Section 5 also establishes that if a member of a house does not follow the established rules, the house may punish its members for disorderly behavior, and by a two thirds vote may actually expel a member from Congress. The establishment of rules, holding a hearing in regards to the breaking of those rules, and punishing a member for his behavior, as set forth by Article I, Section 5, was recently used when Charles Rangel broke the rules of the House of Representatives, faced a panel for his actions, and was punished by censure. Article I, Section 6 goes over compensation, and the rules regarding such. Section 6 also establishes that members of Congress may not be detained while traveling to and from Congress, and that they cannot hold any other office in government while in Congress. This section also indicates that no member of Congress shall be appointed to a later office if while in Congress the office was created, or a raise in pay was enacted for that office - The position of Secretary of State received a raise while Hillary Clinton was in the Senate, so technically she was not eligible for the position when she was appointed. To fix this, the Democrats applied the Saxby Fix, meaning they undid the raise, and Hillary receives the compensation that was in place before the vote she participated in while in the Senate. The Saxby Fix, then, is defined as a Salary rollback. Article I, Section 7 explains how bills become law. Any bill that raises taxes or fees must be proposed in the House of Representatives, giving "The People" the purse strings. All bills must pass both houses of Congress in the exact same form. When they are not the same, that is when a new vote for one of the bills must be established, or reconciliation is used, which still requires another vote. As the government had been established, the process allowed the people (House of Representatives) and the States (U.S. Senate) to both have the opportunity to approve the bill before it went to the Executive. If the bill is vetoed by the President, it can be overridden by a two-thirds majority by both houses. This allowed the People to constrain the States, the States to constrain the People, and for them to together constrain the federal government (Executive Branch). Article I, Section 8 lists the authorities of Congress. Since Congress has the sole power to make law, this is also commonly referred to as the list of powers of the federal government. Note that all of the authorities have something to do with protecting, preserving or promoting the union. Article I, Section 9 is a prohibitive section, placing limits on Congress. Article I, Section 10 is a prohibitive section, placing limits on the States. The Preamble is an introduction, and holds no legal authority. As the opening paragraph of the United States Constitution, it serves to establish who is granting the authority to create a new federal government, and the reasons for the decision. WE THE PEOPLE of the United States, in Order to form a more perfect Union, establish Justice, insure domestic Tranquility, provide for the common defence, promote the general Welfare, and secure the Blessings of Liberty to ourselves and our Posterity, do ordain and establish this Constitution for the United States of American. We the people of the United States - The people of the states that are united. . . do ordain and establish this Constitution. As with the many quotes by the Founding Fathers, the United States in this instance is there as a plural, not a nationalistic statement. The people in the states that united for the purpose of survival proposed the contract called the United States Constitution in order to create a federal government, grant to it limited authorities, and ensure that it remained limited so as to not infringe on the individual rights of the sovereign states, and the people who resided in those states. As was customary of the founders, the reasons for forming the federal government are listed in order of importance: . . .in Order to form a more perfect Union, establish Justice, insure domestic Tranquility, provide for the common defence, promote the general Welfare, and secure the Blessings of Liberty to ourselves and our Posterity. . . The most important reason for the formation of the federal government, the main purpose of the U.S. Constitution, was “in Order to form a more perfect Union.” A union already existed under the Articles of Confederation, but it was too weak to protect itself. The founders wanted to form a more perfect union, one with more authorities, while remaining limited in its power and scope. And as you read the Constitution, you will notice that all of the authorities granted to the federal government are limited to the union. The federal government is granted the authority to maintain an army and navy in order to protect the union from invasion, to collect taxes in order to pay for that military and the functions for preserving the union, to regulate commerce by acting as a mediator between the States so that the flow of commerce flows regularly in order to encourage a growing economy for the union, establish a uniform rule of naturalization for the purpose of ensuring the union grows through regulated immigration, to establish post offices so that the parts of the union can remain in contact, and so on and so forth. The second reason for the creation of the federal government through the ratification of the U.S. Constitution was to “establish Justice.” Note that the word “establish” indicates that there was no justice prior to the writing of the founding document. However, we are well aware that justice did already exist in each of the States. Therefore, it is apparent that the U.S. Constitution was not written to establish justice in the States, but to establish justice at the federal level where a judicial system had not previously existed. Once again, language has provided for us a clue to the original intention of the Founding Fathers. 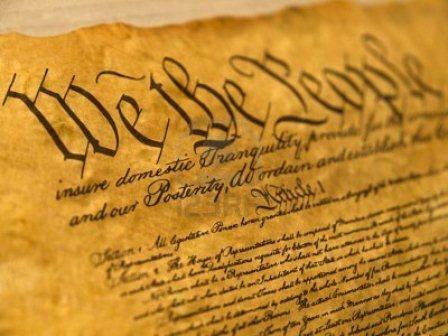 The first two reasons for the writing of the U.S. Constitution, according to the Preamble, was to form a more perfect union through the formation of a federal government, and to establish justice by creating a federal judicial system. Therefore, it seems reasonable to assume that the Constitution was not written for the States, but directly for the purpose of creating and limiting the newly formed federal government, which was designed to serve the states by protecting them, and preserving the union they enjoyed. You see, before the States delegated some of their own powers to the federal government through the Constitution, those powers belonged to the States. The States, however, only granted "some" of their powers to the federal government, retaining most of the powers for themselves. The U.S. Constitution, and all language within the document, is then directed to the federal government, not to the States, unless specifically indicated to be so. This is because the States essentially “hired” the federal government to protect and preserve the union, and the contract that authorizes the federal government to do so is the Constitution. Therefore, it would be foolish to assume that the provisions of the Constitution are to be applied to the States as much as it is foolish to believe that a contract between you and a contractor to build an addition to your house requires "you" to use grade 8 bolts. This also means that it is the States' responsibility to ensure the federal government acts in a constitutional manner. That would mean that it is not the federal court system’s duty to do so. The power that the federal courts have to interpret the Constitution is called Judicial Review, and that authority was not granted to the federal courts by the Constitution. Therefore, Judicial Review is unconstitutional. More on that, however, when we go into Article III. Back to the Preamble, we have to remember that the union was fragile. The States, as colonies, or as states, never got along too well. They had their own culture, religion, and laws. They fought over turf, commerce, and anything else you could think of. The States were much like siblings, fighting over everything under the sun; but when it came down to brass tacks, they were united when it came to defending each other. What those two phrases meant was that because the States didn’t seem to get along too well, the federal government was expected to ensure there was tranquility between the States by acting as a mediator in disputes. Part of that task by the federal government was to also promote the general welfare of the republic. In other words, make sure the squabbles did not place the welfare of the union in jeopardy. Tucked between “insure domestic Tranquility” and “promote the general Welfare” in the Preamble is the phrase: “provide for the common defence.” In other words, almost as important as ensuring peaceful cooperation between the States, and slightly more important than promoting the general Welfare of the republic, was the duty of the federal government to provide protection for the union through a military. Defending this nation was not listed at the top because a country that places too much importance on a military is doomed to become a police state; but defending this nation was not placed at the bottom of the list because a nation that refuses to defend itself ultimately becomes a conquered entity that is subject to the authority of a foreign government. However, one of the primary reasons for creating the federal government in the first place was to indeed protect the union militarily. That is why “provide for the common defence” is listed in the Preamble. Wrong. Though it is one of the reasons, it is not the main reason. You see, as indicated in the Preamble, the primary reason for the Constitution is The Union. However, by creating a federal government, the Founding Fathers realized that they were opening up the potential for the governmental system to become a tyranny. Therefore, in order to protect the rights, liberty and property of the people (more specifically to “secure the Blessings of Liberty to ourselves and our Posterity”), the federal government would need to be limited in its authorities by the rule of law. The law of the land in which the governmental system is limited to, in the case of the United States, is the U.S. Constitution. Understand, the Constitution does not give you rights. If government gave you your rights, then it would be reasonable to assume that the government could take them away. Therefore, your rights are “God-given.” The Constitution, in turn, protects your inalienable, God-given, rights by limiting the powers of the federal government. So, because of the Constitution, the States and the people have all the rights, except those specifically delegated to the federal government by the Constitution. Though I am not one to be always in complete agreement with birthers, like the fact that I am not as completely convinced as they are that Obama was born in Kenya (though I believe it may not be completely out of the realm of possibility), I do have questions about the birth certificate. 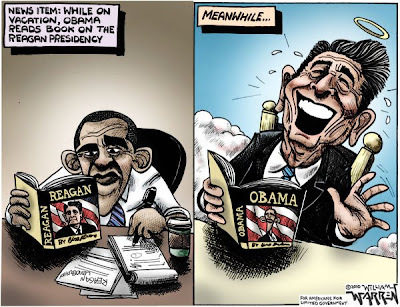 I wonder why Barack Obama has spent a lot of money sealing records, or why something as simple as the long form of his birth certificate has not been produced. Like the birthers, I do question Obama's eligibility to be President of the United States, largely because of the fact that a part of the definition of natural born citizen requires for the father to be an American citizen so that there are no divided loyalties. Birthers are an interesting group. In most cases, folks are either in agreement with them, or believe them to be complete crack-pots. However, lately, the largest critic of the birther movement has been new Hawaii Governor, Democrat Neil Abercrombie. Abercrombie has decided that once and for all, he is going to shut the Birthers up by producing the documents that would be the final proof that Barack Obama was indeed born in Hawaii. He is quoted as saying, "It [the Obama birth certificate controversy] is an insult to his [Obama's] mother and to his father; they were my friends, and I have an emotional interest in that. It's an emotional insult. It is disrespectful to the president; it is disrespectful to the office." Governor Abercrombie recently asked his state attorney general's office and the director of the state Health Department to see how he can bypass Hawaii's privacy laws and release more information regarding the Obama records that exist there. Abercrombie claims to have seen baby Obama in Hawaii all those years ago. Though the governor has admitted that he was not present at the still-unidentified hospital in Honolulu to witness Obama's birth, Abercrombie long has claimed he socialized with Barack Obama Sr. and Ann Dunham Obama when Barack Obama Jr. was yet a baby. "Maybe I'm the only one in the country that could look you right in the eye and tell you, 'I was here when the baby was born,'" Abercrombie told the Chicago Tribune. As a graduate teaching assistant in sociology at the University of Hawaii when Barack Obama Sr. arrived in 1959 from Kenya, Abercrombie was in fact in Hawaii during the time that Obama was said to have been born there, or at least that's the way it seems. However, the problem with Abercrombie’s testimony is that Barack Obama Sr. and his wife, Ann Dunham, did not live together as man and wife with their baby son as Abercrombie claims to have witnessed. Could the anti-birther governor possibly be lying? Ann Dunham, it turns out, was at the University of Washington in Seattle on the other side of the Pacific Ocean, within three weeks of the baby's birth. As for those two newspapers that announced Barry's birth in Hawaii, it turns out that the address used was an address maintained by Ann Dunham's parents, Madelyn and Stanley Dunham. In August 1961, when Barack Obama Jr. was born, Barack Obama Sr. maintained a separate address in Hawaii. In addition to that inconvenient little fact, there is also no documentary evidence that Barack Obama Sr. and Ann Dunham ever lived at the same address together as man and wife. Contrary to Abercrombie's assertion that he spent social time with Barack Obama Sr., his wife, Ann Dunham, and their child, Barack Obama Jr., the documentary evidence strongly suggests that while Ann Dunham was in Seattle attending the University of Washington, Barack Obama Sr. lived the life of a bachelor in Honolulu. Strangely, Abercrombie is the only witness on the public record claiming a recollection of Barack Obama Sr., Ann Dunham and Barack Obama Jr. living together and interacting with him socially as a family in Hawaii. Now, Abercrombie won't even accept interview requests on the subject. What's up with gold? Or why is gold up? I have been a huge fan of precious metals for years, but now more than ever as gold hits new records. Gold is now consistently hitting above $1,300, which is an amount that only the most alarmists declared as a possibility a few years ago. The reasons people are moving quickly to precious metals are numerous and simple -- massive bailouts of 2008 and 2009 (and continuing today) not only changed the way our nation spent money, but the way (in terms of quantity) they print it also. The enormous amount of spending by our government -- at a pace that increases the deficit annually at a rate higher than our total debt a few decades ago -- has been frightening to observe. As a result of such spending, government is mass producing money to pay its bills. The government prefers this approach to solving its problems because, since the government prints the money and release it first, it enjoys this "funny money" at its highest value. It is only after it circulates through the economy that it loses its spending power and reduces the value of all other dollars in the market. Inflation is simply defined as "too much money, chasing too few goods." High prices is only one of the many symptoms of such a policy. In addition, inflation plays on the ignorance of a population who has no idea that these increases in prices are caused by these devalued dollars. Most voters will blame businesses for their "greed" and price raising, not the politicians who make such a phenomenon necessary. Simply put, every new dollar pumped into the economy takes away the value of all the dollars in the market, unless there is a comparable increase in productivity. Inflation is a monetary tax -- one that takes away the value of your money, instead of actually taking your dollars. In one day in 2009, the United States took a chapter out of Zimbabwe's playbook by pumping $1.2 trillion into the money supply in an attempt to pay off its bills. Many Americans have (rightly) been alarmed by the more than $1.5 trillion we have seen in bailouts. According to the Washington Post, these inflationary efforts could have far reaching implications, noting that "combined with the billions already deployed by the Fed, the new money dwarfs even the biggest government bailouts of financial companies." Historically, this type of monetary policy leads to the kind of inflation that we have seen in history books, where it is cheaper to use money for wallpaper than to buy it or it requiring a barrel of money to buy a loaf of bread. I have seen the images of street cleaners sweeping dollars in the street. Printing worthless money will not make our problems go away, but make issues we have never imagined. If cheap money made countries rich, all we would need to do is send printing presses, paper, and ink to Third World nations. This tax on the value of money is one of the few that can be fought by taking action. Individuals can actually reduce their "monetary tax" burden with every precious metal purchase they make. Gold, silver, and other precious metals are at an all time high because of the inflation we have suffered over the last two years (again, too much money chasing too few goods). It is only expected to get worse. Precious metals are a tool for shoring up the value of money. It is an insurance policy to your wealth. As the money supply is inflated, those with gold or other precious metals will see their wealth enjoy a greater level of protection and their "monetary tax" burden greatly reduced. Those who do not move towards precious metals either do not fully understand our current economic crisis or are as apathetic as the millions of Americans who still sit on the sidelines rather than participate in the massive political wars we are engaged in today. People need to make a difference in the national economy through elections and preserve their personal wealth through precious metals. Today our dollars are backed by the "good faith and credit of the United States." Most people laugh when they hear such until they think about their own money. Since 1971, the relationship between gold and money has been severed; fortunately we still have the right to shore up the value of that wealth through the purchase of precious metals. 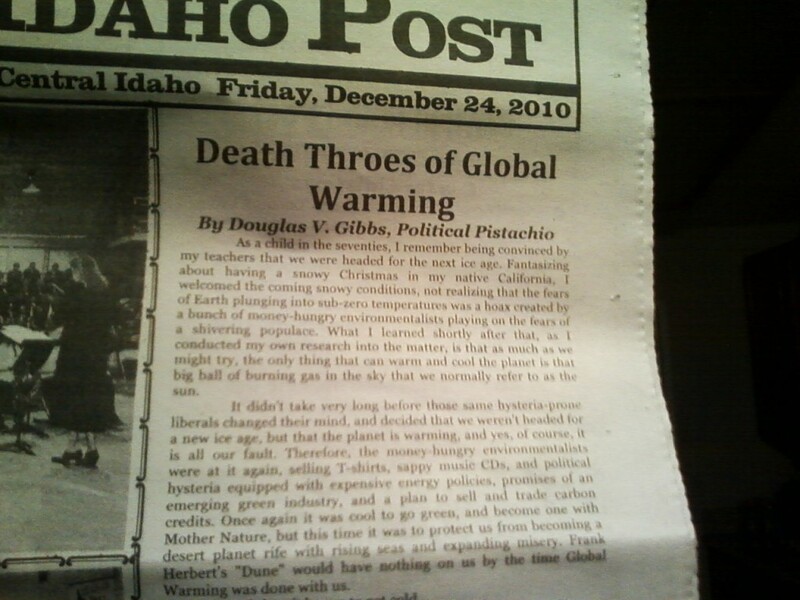 "Death Throes of Global Warming" Makes the Front Page! A few publications publish my work, on occasion. 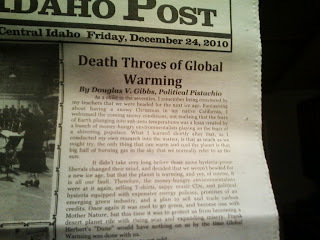 A newspaper in Idaho, The Central Idaho Post, recently put one of my pieces on their front page. Not the first time I've hit their front page, but I always enjoy it when it happens. For those of you that wish to read that article, it has also appeared right here on Political Pistachio. Death Throes of Global Warming. 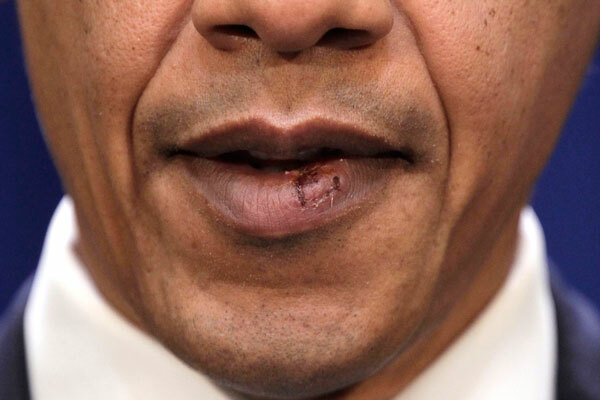 When Obama busted his lip playing basketball, it was big news. I questioned his playing style, and even wondered if the basketball injury was just a story to cover up that Michelle had hauled off and fattened Barry's lip. Now, about a month later, Barack Obama missed taking a golf ball to the head by a matter of two feet. As an avid golfer, I figured someone from another fairway had smacked a wicked slice, and put their wayward Titleist on a deadly trajectory heading straight for the President's golf cart zone. Innocently unaware of the incoming sphere, unknowing Obama (still nursing a stitched up lip) lucked out that the slice had not gone two feet farther. Then, I found out that the ball that nearly hit Obama was a shot out of the rough by one of the players in Barry's group of golfers. Then it occurred to me. Obama isn't unlucky with balls. He's unsafe. Unless the shot out of the rough was heading back toward the tee box, Obama's near zonk to the dome with a dimpled white golf ball was nobody's fault but the President's. On the golf course, you don't (as a rule) travel down the fairway beyond the balls of the guys getting ready to shoot. The next golfer in turn is always the person farthest from the green, which means there is no reason to go down the fairway past the ball farthest from the green. It is not just a matter of golf etiquette, but also a matter of safety. Obama put himself in harm's way by going down the fairway. Barry is not the first golfer to do such a stupid thing, and he won't be the last. But, considering my experience as a golfer of nearly twenty-five years, I have noticed that the kind of people who tend to do that sort of thing tend to be the kind of people who think they are a better golfer than everyone else, and they just can't lower themselves to wait for the slower, less talented golfers. You know the kind of person. Narcissistic, self-absorbed, and under the firm belief that they could walk in a godly manner on a cloud of smoke across a firing range and not get hit. Now, back to that basketball injury. Along with golf, one of my favorite games to play is basketball. I've been playing in pick-up games for the last thirty-plus years, and I have taken an injury to the face only once. Despite my aggressive play, the only injury to the face I have every taken in a basketball game was back when I was fifteen years old, when a player grabbing a rebound came down and landed his elbow to my nose. The collision busted up my nose pretty good, and from there on out, I continued to play aggressively, but not by leading with my face. Obama's injury to the lip, and his near miss on the golf course, tells me one of three things. Either Obama is new at the games, he is an unsafe individual who takes no precautions, or he doesn't learn from his mistakes in regards to past experiences. I am thinking, based on his politics, its the third possibility. More than 200 years have passed since the Constitutional Convention in 1787 where the Founding Fathers of the United States of America provided the framework for the creation of the U.S. Government. The federal government was designed to protect, preserve, and promote the new union of sovereign states, while being limited in its authorities in order to preserve the basic rights of the individual states, and the American people. The U.S. Constitution is the law of the land, and all laws made in pursuance of the U.S. Constitution by the federal government are the supreme law of the land (Article VI, Clause II). The U.S. Constitution is the starting point from which all of our government institutions come. The founding document is the wisdom of the ages, crafted purposely to serve as the foundational base of our system of governance in order to form a more perfect union, while protecting the basic ideals of individual liberty, individual freedom, and our inalienable individual rights from the federal government, or any tyranny that may rise against us, foreign or domestic. This new government was to be based on republicanism, rather than a monarchy, while using some functions of a democracy in order to elect the representatives that would serve in the system. As a social contract between the States and the newly formed federal government, the U.S. Constitution grants to the federal government a limited number of powers, reserving the remaining powers to the States (Tenth Amendment). The limiting principles set forth by the U.S. Constitution were designed to protect the States’ sovereignty while giving the federal government enough authority to properly protect and preserve the union of individual states. As a result, the United States of America was not designed to be a nationalistic entity, but rather a federation of sovereign states that have granted the authority to maintain the union to a federal governmental system. To understand that the Founding Fathers looked upon the new country as a federation of states, and not a nationalistic entity, one must only look to the language they used. "Governments, in general, have been the result of force, of fraud, and accident. After a period of six thousand years has elapsed since the creation, the United States exhibit to the world the first instance, as far as we can learn, of a nation, unattacked by external force, unconvulsed by domestic insurrections, assembling voluntarily, deliberating fully, and deciding calmly concerning that system of government under which they would wish that they and their prosperity should live." -- James Wilson, November 26, 1787 in remarks in Pennsylvania ratifying convention. “The United States enjoy a scene of prosperity and tranquility under the new government that could hardly have been hoped for.” George Washington in a letter to Catherine Macaulay Graham, July 19, 1791. In both quotes, if you locate the words “United States,” you will notice that in both cases the word following “United States” does not end with an “s”. This is a significant clue to understanding how the founders viewed the new country. They saw the United States not as a single nationalistic entity, but in the plural, or as a collection of sovereign states united for the purpose of protection, and the preservation of the American way of life. To further illustrate what I mean, let’s use the word “dogs” in the place of “United States.” If you were to say “the dogs exhibit to the world,” it makes sense that there is more than one dog. If you say “the dog exhibit to the world,” your first realization is that the phrase uses bad grammar. The proper way to say it would be “the dog exhibits to the world.” Dog is singular, therefore the word following it must contain an “s” at the end of the word. “. . . the United States exhibit to the world the first instance, as far as we can learn, of a nation. . .” The United States is a nation, the quote says so. However, the fact that “exhibit” has no “s” reveals that Mr. Wilson did not see the United States in the singular, or as a nationalistic entity, but as a nation of states - a federation of states. The United States, in this quote, is in the plural. The United States, then, in this quote, could very well have read “these states united,” and it would have meant the same thing. Mr. Washington’s letter reads, “The United States enjoy a scene of prosperity and tranquility under the new government that could hardly have been hoped for.” Once again, there is no “s” at the end of the word after “United States,” meaning that Washington was not referring to a single nationalistic entity, but to a collection of sovereign states. As with Mr. Wilson’s quote, George Washington could have written “The States that are united enjoy a scene of prosperity,” and the sentence would have meant the very same thing. Understanding how the founders viewed the union is important because it reveals much about why, and how, they wrote the United States Constitution. The founding document was not written to create a national government, but to create a federal government with the power to protect the union of individual states. In other words, the Constitution enables a governing body to protect and preserve the union of the States that are united. To better understand this, one must consider the important distinction between a nationalist, and a patriot. Patriotism is the wholesome, constructive love of one’s land and people. Nationalism is the unhealthy love of one’s government, accompanied by the aggressive desire to build that governmental system to a point that it is above all else, and becomes the ultimate provider for the public good. In short, Patriotism is love of country, Nationalism is love of government. Though a federal government could potentially be a bad thing, no federal government was an even more dangerous proposition. The Founding Fathers realized that if the states had not united against the British Empire, the Revolutionary War would never have been won. And as a nation, without a federal government wielding enough power to field an army, or tax in order to pay for that army, the new country would not long survive. The Articles of Confederation, a loose agreement between the States, proved to be too weak in the face of Shays’ Rebellion. So, the Founding Fathers set out to create a new government with enough power to form a more perfect union, yet limited enough that it did not become a centralized tyranny such as the one the patriots had just defeated in the War of Independence. The British Empire was ruled by men. The King believed Britain to be his realm, therefore the concept of property ownership was limited to a small group of land owners, who were the Lords of Britain. The King, and the nobles, had complete power over making law, and imposing taxes. Therefore, the Founding Fathers realized that a nation ruled by an oligarchy of political elite was not compatible with the society that would champion liberty, and individual rights, that the founders desired. A Democracy is a system of government ruled completely by the people. All laws and governmental functions, in such a system, are determined by the whim of the people. Historically, democracies are transitional governments that, when the people seek a governmental system more efficient and stable than their fickled democracies, become oligarchies, or a governmental system characterized by the many being ruled over by a few political elites. Therefore, the founders did not desire to create a democratic governmental system, because ultimately the system would centralize, and become nothing more than the monarchy that the Americans had fought so hard against in order to gain independence. The conclusion was that the United States must not be subject to the laws of men, be subjected to the rule of men, or open itself up to become an oligarchy by creating a system that enables too much power to be granted to a single person or governmental entity. Therefore, the new nation needed to be a nation subject to the laws of God, governed by the rule of law, and have a republican form of government that features a representative system of governance. The States, and the people, would need to hold sovereign power. The federal government would need to be limited to authorities only necessary for protecting, preserving and promoting the union. All other authorities, specifically those authorities that would address issues directly affecting the people, would need to the responsibilities of the States, and the local governments, where the people have more control over governmental functions. To achieve their goal, the Founding Fathers determined that the components of this new federal government, as opposed to being a national government, would need to be one with three separate branches of government, whose powers are separated so that no collusion between the branches could be possible, with numerous checks and balances to ensure no part of government wields to much power, have a limitation of authorities to the federal government granted by the States, provide due process of the law with the right of a trial by jury, and be a system that ensures that the federal government does not betray the inalienable rights of the people of the United States. To achieve this, the Founding Fathers argued and debated heavily for four months in 1787. The result was the U.S. Constitution, a document like no other. The American Form of Government, through its constitution, would serve as a protector of the fires of liberty by preserving the union of states, and ensuring that individual freedoms and state sovereignty maintain a voice in the system. The nation would prosper, to the surprise of the world, and maintain its system of limited government for more than 200 years. Unfortunately, the original intention of the Founding Fathers has been whittled away by the creeping incrementalism of progressive thoughts and ideas. Those that oppose the American Form of Government wish to move our nation in a direction of a more centralized government, where the central authority wields great power, which ultimately results in a system that uses its power to rule over the people through the rule of man. The rule of law, under such a system, is then transferred to the courts, and law becomes determined by the opinions of a few powerful men. Under a progressive system, the federal government does not limit its actions to the powers granted to it by the States. The federal government seizes its powers without ratification, claiming it is acting on behalf of the common good. Ultimately, under such a system, the United States Constitution will be disregarded as simply a set of guidelines that the federal government can choose whether or not to follow, and different groups in the population would begin to receive special privileges, or a classification as a protected class, which is not uniformly granted throughout the population. We the People have the duty to ensure that our governmental system does not operate outside Constitutional boundaries. It is our duty to protect our God-given liberty, and restore our Constitutional Republic. That journey begins with understanding the original intention of the Founding Fathers, and educating ourselves and our posterity about the U.S. Constitution, and working to restore our government to the constitutional limitations our Founding Fathers intended. As a result of the original intentions of the Founding Fathers which are contained within the pages of the United States Constitution, our nation has prospered as a unique republic. In the words of George Washington, “The United States enjoy a scene of prosperity and tranquility under the new government that could hardly have been hoped for.” That is, if we can keep it. I usually deal with sordid FACTS about the CULT belief system that the media, academia and Muhammadan Muslims erroneously and falsely call the ‘religion of Islam’. Because currently is the season of goodwill and merriment, I would like the American people – whom I am addressing – to be very careful NOT to offend the Muhammadan Muslims amongst them. To achieve this sublime and friendly gesture, the American people ( Christians, Buddhists, Hindus, Jews, Zoroasterians, Animists, Pagans, Atheists, Agnostics, etc), I bring to your attention a report from the Amboy Times, dated 12th Feburary 2007 (even THEN some people had the intelligence to figure out that what the world community if facing is a virulent disease, a Pandemic, called Muhammadan Islam). All day I've been hearing political talker after political talker discuss who they believe will be Obama's choice for his new Chief Economic Advisor. Perhaps he is thinking about his choice while on Christmas Vacation in Hawaii, they contemplated. Whoever it is, the talkers wondered out loud, it will have to be someone that will help him with his struggles to fire up the economy, and knock down the unemployment rate. Hmmm, let me give you a hint. . . it doesn't matter who Obama chooses because whoever it is, the person will still be a hard left liberal with failed ideas. Obama is a student of the Keynesian economic theory (a theory that fails, and fails, and fails), so he has no interest in choosing an advisor with any real private sector experience. All he picks are academics who shares his "prime the pump" economic insanity. What is even more comical is the moron actually thinks he has been good for the economy, and that things have gotten better. He truly believes he pulled us from the brink, as he drives us to the brink. Yes, I know that holiday spending was up 3% (If you remember, they said that last year too). That means nothing. Gun sales were up when Obama first took office, and it had nothing to do with the economy. Besides, despite the increase in year end consumer spending, we have also received news that consumer confidence has fallen. Fact of the matter is, Obama and the Democrats have done nothing but screw up the economy, while spending at horrendous levels. Until the unemployment rate improves, the housing industry improves, and the private sector grows, the recession will be far from over. As for those that claim that the slightly up GDP is evidence of recovery, realize that that is due to government growth. Economic improvement comes when the private sector grows, not when the government goes on a spending spree. And just watch what the GDP does when the government begins to realize it needs to can many of those working for it, lays off people, and spending is cut. Growth of the GDP is only important when that growth is the result of private sector growth. Watching the above video of city workers seemingly not caring as they literally pound an SUV with a loader in tow is a great example of government at work. Like most Muslims, and liberal Democrats, Congressman Keith Ellison of Minnesota is not too fond of America in its current form. Coincidentally enough, he is both a liberal Democrat, and a Muslim. Therefore, it would not be a surprise if Ellison showed signs of disdain for America, fueled by both his liberal ideology, and his Muslim belief system. Keith Ellison has recently determined that the United States is committing "economic warfare" in order to "impose" its will on countries. His comments were referring partially to economic sanctions imposed on Islamic nations that are not abiding by the reasonable requests of the free world. Ellison, like most Marxist authoritarians, has determined that equity must be the goal, as if appeasing Muslim nations that stand against freedom will change anything. At the same time, Ellison also indicated that the U.S. borders are irrelevant. And of course a nation without borders is a nation that has no sovereignty. Why would Ellison say such things? Could it be that he desires the dismantling of America? And if so, who does he believe should gain control over the nation? Ellison, as a Muslim, supports the Islamic Jihad. Islam's goal is to fly an Islamic flag over the White House, so by association, Ellison no doubt believes the same. What do you call a government official who supports the overturn of the American government so that a foreign entity may gain control? Keith Ellison, whether he is willing to admit it or not, desires our constitution to be replaced by Shariah law. While at the University of Minnesota Ellison wrote respectfully of Farrakhan and defended Khalid Abdul Muhammad's notorious anti-white, anti-Jewish, and anti-gay (remember, Islam hangs gays by the neck) opinions. Ellison has been a long-time supporter of the Nation of Islam, and he has written a number of times criticisms of the Jewish People. Ellison has also supported the Council on American-Islamic Relations (CAIR), which is well known for supporting, and funding, terrorist groups. In fact, in 2009 Ellison spoke at three fundraising dinners for the organization and gave videotaped statements at others. He appeared with CAIR officials at meetings on healthcare reform and Eid festival celebrations, as well. In October 2009, Ellison rebuked four House of Representatives Republican members who called for an investigation of CAIR for infiltration of government committees. Soon after that he attended a CAIR fundraising event in Washington and called for CAIR supporters to apply for jobs in the incoming Obama administration. Ellison’s connections to other groups is also cause for alarm. He has ties to the Muslim American Society (MAS) which is simply an American chapter of the radical Muslim Brotherhood, an organization that represents a significant threat to Western civilization. This would mean that Congressman Ellison also serves as a significant threat to the West - and he is a member of the U.S. Government. Ellison also enjoys a relationship with the Islamic Society of North America (ISNA), an organization that has been linked by several agencies that support terrorism. Despite the ISNA's troubling connections with terror groups, and organizations, that support Islamic terrorism, Ellison has spoken at the ISNA’s 2007, 2008, and 2009 conventions, events estimated to be the largest annual Muslim gatherings in the Western hemisphere. In a word, as realized by most conservatives when Ellison took his oath of office with his hand on a Koran, the enemy has infiltrated our United States Congress, and he is now making a move to encourage an end to American sovereignty - a move that would open America wide open for Islamic influence, and ultimately an Islamic takeover. With or without Ellison, Islam is making a move on America. Ellison is simply helping the Jihad along. And for that, I think him to be no less than a traitor to America. When Jordan's King Abdullah II accepted an invitation to visit Iran after being invited by Mahmoud Ahmadinejad, it was a sign that America's most loyal ally in the Middle East was moving away from stability, and towards the madness of radical Muhammadan Islamism. In its quest to dominate the world, Islam's efforts to bring the Muslim world together is proceeding as planned. Good news for the Jihad, bad news for the free world. Iran has indicated that the visit between Jordan's king and Iran's leadership was motivated by a desire that the two nations work together so that the Islamic nations can unite. King Abdullah is reported to have said that his country recognizes Iran's nuclear rights and supports its access to "peaceful" nuclear technology. Jordan's Abdullah once warned the world about the ambitions of Iran. In 2004 Abdullah warned of a "Shiite crescent" extending from Iran to Iraq, through Syria to Lebanon. His warning fell on deaf ears. As predicted by King Abdullah, Lebanon and Syria have fallen under Iranian control. In addition to Iran's expansion into the nations south of her, Iraq, Turkey, Qatar, Gaza, Iran has been courting Oman, Yemen and Afghanistan to be either willing or unwilling members of the Iranian axis of influence. With Iran's increasing influence, and the nation's move towards graduating into the club of nations with nuclear power, and a delivery system to go with it, the American Government is surprisingly not showing any concern. The unwillingness of the Obama administration to take any action at all, combined with a WikiLeaks leaked cable from April 2009 written by US Ambassador to Jordan R. Stephen Beecroft, Jordan's frustration and concern over the Obama administration's incompetence in handling the Iranian threat has become an increasing concern in the region. Jordanian Senator Zaid Rifai has been blunt about the danger of a nuclear Iran, saying that the U.S. needs to bomb Iran's nuclear installations, ". . . or live with an Iranian bomb. Sanctions, carrots, incentives won't matter." The Obama administration's commitment to appeasing Iran is being seen by our allies in the region as being dangerous for the nations in the Middle East, and ultimately deadly for the entire world. Failure by the U.S. to act against Iran is literally encouraging the Arab states to try to reach an agreement with Iran, in the hopes of keeping the peace - thus further expanding Iran's curtain of terror over the Middle East. Simply put, for fear of Iran, the countries will be defecting to the Iranian camp. As the Obama administration stands idly by over Iran's increasing power in the Middle East, the Democrats are also remaining silent over Iran deepening its military alliance with Turkey and Venezuela (including a missile base with the capability of sending missiles capable of reaching American cities) while escalating its proxy war against the U.S. and its allies in Afghanistan. Iran's aggression is being viewed as a diplomatic issue, rather than a reason to put our military technology into action with precision bombing. Obama is literally turning his back on our Arab allies, has been harassing Israel, and is working to withdraw as many forces from the region (Iraq and Afganistan) as he can in the near future. The nations in the Middle East that fear Iran feel abandoned, and the Obama administration's response to their fears are more talks, without any preconditions. Jordan's dependency on Western powers has been cut by Obama, and Jordan's last resort is either to depend on Israel, or reach out to Iran in the hopes of making peace with the radical Islamic nation. Iran recognizes America's actions of appeasement as weakness, and this will encourage Iran to act in a bolder manner - thereby placing the world in greater danger. Iran's boldness will result in many deaths, and the blood will be on the Obama administration's hands. Islam is not willing to negotiate. Islam is patient, taking action when their perceived enemy acts in a weak manner, and backs down when their enemy acts in a manner of strength. Meanwhile, Israel is the stabilizing factor in the Middle East. If we continue to abandon our Arab allies, and finish off by turning our back on Israel, the region will, for lack of a better word, explode. Watch the video I have posted below carefully. Notice how the men holding up the signs send a sexual message, while the anger is mixed with out of control profanity. The truly alarming part of it, however, is that young children are used in the video, as well. The video comes across like a bunch of crying people throwing a temper tantrum. I get it, they are angry because their perverted behavior is not accepted by people with morals. But those people that oppose homosexuality, save for freaks like the Phelps gang from Westboro Baptist, don't hate gays. We truly don't care what they do in the bedroom. Homosexual behavior is immoral, and carries with it the potential of serious consequences (especially when it comes to the men - medically the behavior can be very damaging to the body - not to mention AIDS), but those that oppose the behavior do not wish to use government mandate to force them to stop acting in such a sinful manner. Free will dictates that they be free to act in that manner. But, those that believe the homosexual behavior to be a perversion, don't teach our children anger, or teach them to sling profanity at people with hatred behind the anger. As for calling those who have a problem with homosexuality "haters," the honest to God truth is we don't hate gays, no more than we hate any other person under the spell of sinful behavior. We are all sinners, after all. The difference is simply a matter of repentance, which is a recognition of the sin, and turning away from it. Once again, be warned, this video is filled with hate and profanity, but I think to get across the point of how hateful some members of the homosexual community truly are, I felt it necessary to show the video. Once again, realize these people are spewing hate and are calling people haters who never said they hate gays. In fact, I not only don't hate homosexuals, I feel really bad for them because the torment of the prison of their addictive behavior must be terrible. The slavery of their behavior must be horrendous. Now, I would like to address the profanity for a moment. I rarely cuss, and I am known to be one that prefers not to have the people around me going into fits of profanity. This is not to say that I have never used this kind of profanity. For God's sake, I used to be a Navy sailor, and a construction worker, so profanity is not exactly something I am not familiar with. But as I look back at my life the years that were filled with the most profanity usage had two things in common. I was young and immature, and I was angry. That is the thing about profanity. Cussing normally accompanies anger. Therefore, people who sling around profanity a lot, as I have myself in the past, are normally angry people, or the profanity is being used during an angry moment by a person that may not be normally an angry person. I realize that was a fairly general statement. I realize that for some people profanity is just how they speak, and anger has little to do with it. These people, however, are the exception, not the norm. So, it is clear based on that video that the people in the video are exhibiting anger, and they are teaching their children to be angry and hateful. The reasonable question, then, is: Why are they so angry? In fact, why are they so angry that they are even willing to use children in a calculated effort to push their profanity filled anger upon a society such as in this video? You know, in a normal circumstance, that would be considered child abuse. The anger comes from the fact that homosexuals are seeking acceptance of their abnormal behavior, and like a child that doesn't get his or her way, they are throwing a tantrum. 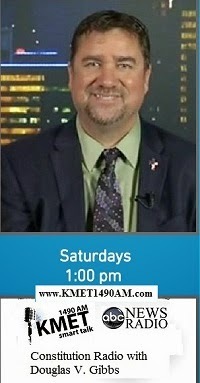 The interesting part of this tantrum, however, is that they are attacking a group for failing to believe what they believe, are falsely accusing those that disagree with their behavior of hating them, are falsely accusing those that disagree with their behavior of wishing to force them to be different, and are intent on pushing their agenda on us, and our children, as being accepted as a normal behavior when our belief system does not agree with theirs. In fact, the gay agenda is trying to force the teaching that homosexuality is normal into the schools, and all facets of society through the media, entertainment industry, and every other medium they can get their hands on. . . while complaining if a Christian Cross can be seen in the public square. Remember that these are the same people who demand a separation of church and state because they are afraid Christians, by doing things like praying in school, may force their beliefs upon them. Hmmm, so if I pray in school that is wrong because I am forcing Christianity on you, but your belief that homosexuality is not a sexual perversion is supposed to be taught to my kids whether I like it or not? And if I complain about it, I am labeled a hater, and I am yelled at with angry profanity, even by children, as in the above video. However, Christians can be called every name in the book, filled with angry profanity, and can even be ridiculed with every chance possible, right? Um, please tell me what's wrong with that picture. A normal person regrets things said in anger, and feels bad for spewing profanity. These people are proud of their profanity-laden anger. 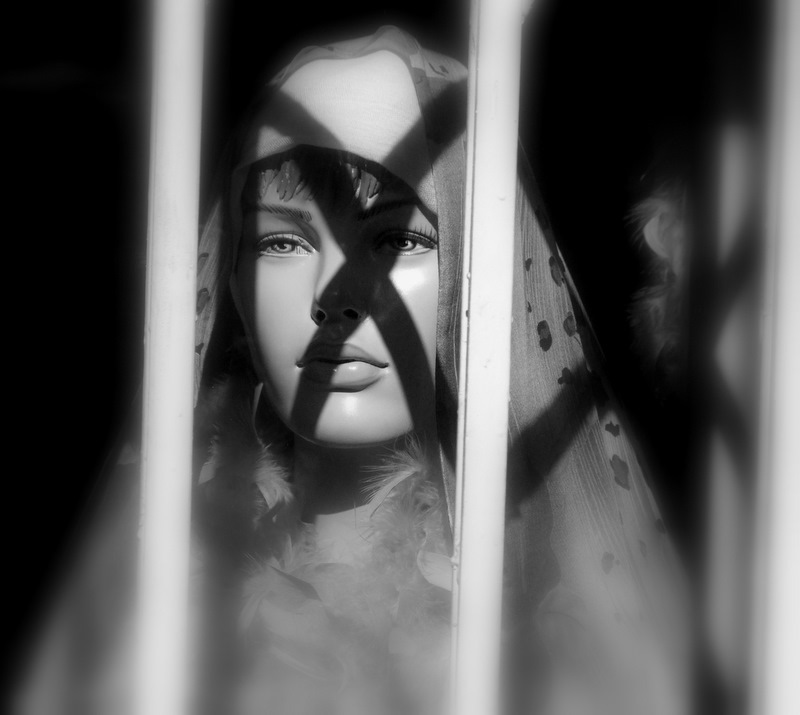 A normal person recognizes bad behavior for what it is, and regrets committing the sin. These people not only are proud of their immoral behavior, but wish to convince everyone that it is not only okay, but that all people ought to try it at least once. They want you to believe that their homosexual behavior is as a part of them as the color of their eyes, and that there is nothing they can do about their perverted sexual tendencies. Kleptomaniacs try to convince us they have no choice but to steal because they are born that way, but that doesn't make their behavior normal either. And in the process of pushing the homosexual agenda, while crying that a child carried a Bible to school, they wish to indoctrinate our children with the homosexual message, and indoctrinate all of society, in an effort to convince everyone that their behavior is normal, and that they should be a protected segment of society as if they are some kind of ethnicity or skin color. And while they indoctrinate our children with their agenda, they put out videos like the one above to send the message that it is wrong to hate homosexuals by teaching the children in this video to hate, and cuss at, anyone who is against homosexuality. Wow, that was real moral, wasn't it? So why was the video made? Obviously, the hateful message is an angry protest against Americans who don't want homosexual marriage in our country, gays in our military or homosexuals to adopt children in our country. These are people in Canada trying to force change in America. But why do we not desire homosexual marriage? Is it because we hate gays? Of course not. It is because we believe that homosexuals should not be able to force their behavioral belief on a Christian institution, like marriage. In other words, we don't care what you do in the bedroom, but don't shove your bedroom in our face! Who, I ask, are really the haters? The very thought that schools have moved away from The Pledge is disturbing. The fact that bringing back the Pledge of Allegiance, but only once a week, bothers me. But the worst part of this whole story is that the school's principle felt it necessary to send home permission slips before allowing the kids to recite The Pledge. their kids about the Pledge. Is this a case of the school trying to "encourage" the parents on how to raise their children?And since when should a permission slip be sent home for The Pledge? Does the principal deem the Pledge of Allegiance to be something dangerous? Something radical? The school, which is in the Boston area, seems not to be following Massachusetts state law, for the law says that teachers must lead their classes in daily pledges at the start of school. Under Brookline school policy, the recitation may take place weekly. And yes, I can see the liberals foaming at the mouth from here, trying to spit out that the Pledge of Allegiance actually began long ago by the urgings of a socialist in the hopes of creating a nationalist attitude in the States. The Pledge was even recited, at that time, with Nazi-style salutes by the children. But before we let the liberals trash America too much, like they love to do, let me remind them that the greatness of American Patriots took what was meant to be a national socialist salute, and turned it into a patriotic pledge that resides close to our hearts. Once again the patriots of America are victorious. With our exceptional spirit of liberty, we always seem to be able to turn things originally created to destroy us into a beloved show of patriotism.